Hey kids! That's right; you are looking at Tiger Woods' Wedge. 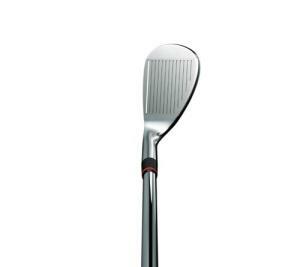 The very wedge that he hit on the 72nd hole of the 2008 US Open at Torrey Pines. Of course you remember it set up his 5-foot birdie putt that forced an 18-hole playoff with Rocco Mediate. Right?? And Tiger won! Well this is not the exact one, but one just like it. What's more is, this is probably the same club that Elin (Tiger's wife) used to eradicate Tiger from his SUV. That's right, -- she busted out both of the back windows with this bad boy. The grooves are High Rev Grooves. They are milled into the face to the maximum allowable limit and produce a tremendous amount of spin. However, if you need a good solid club for breaking out car windows, with a D5 swing weight the Nike VR Wedge has a solid heavy feel, but not too heavy that a petite nanny/supermodel couldn't wield it wildly over her head and bust out a car window like it was champagne glass.